Art Deco is a design style which was popular in the 1920s and 1930s. This French Postage Stamp was issued in 1925. 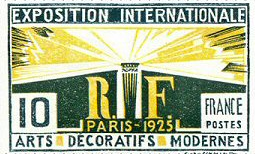 The term Art Deco was derived from the 1925 exhibit in Paris called Exposition Internationale des Arts Décoratifs et Industriels Modernes (International Exposition of Modern Industrial and Decorative Arts). Here you can find more postage stamp art and Custom Art Stamp philatelic and stamp collecting information.